2 layer board of 1.41 x 0.71 inches (35.7 x 17.9 mm). Uploaded: October 30th, 2017 15:23. 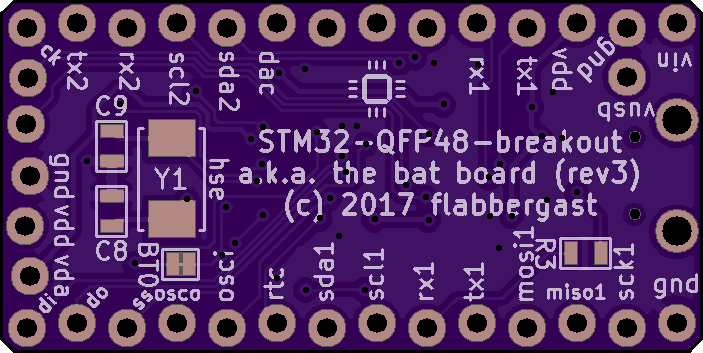 A teensy-sized breakout board for QFP-48 STM32 MCUs (rev3). 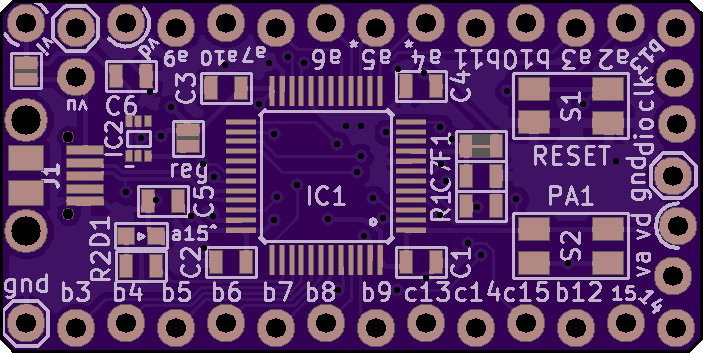 Originally designed for STM32L052CxTx, but should work with any pinout-compatible MCUs (most of LQFP-48 packaged STM32s should work, but check the datasheet! 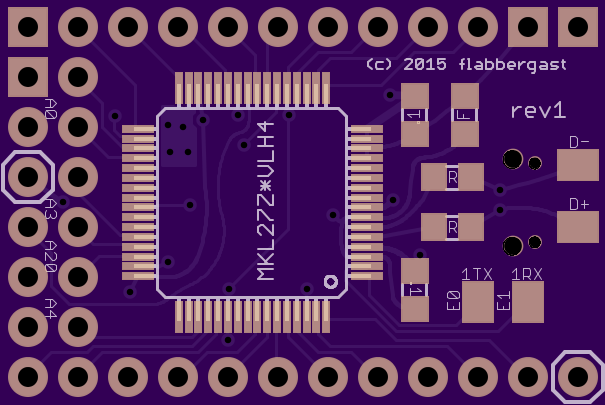 Tried with STM32L052C8T6, STM32F072CBT6, STM32F103C8T6). Intended for low-power applications (e.g. sensors). power options (USB <-> solder jumper <-> VIN <-> regulator <-> solder jumper <-> VDD net) - so it is possible to bypass the voltage regulator entirely; or add a LIPO-charger external module. 2 layer board of 1.21 x 0.81 inches (30.7 x 20.6 mm). Uploaded: October 5th, 2015 18:20. 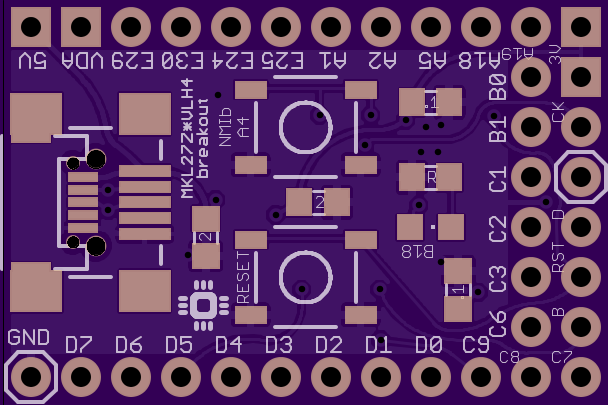 A small breakout board for Freescale KL27Z chips that come in LQFP64 package. 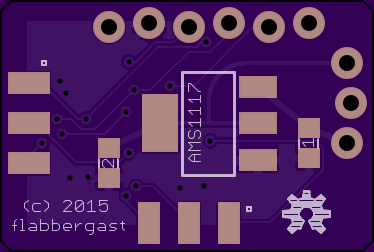 Just USB (mini or micro), reset button, NMI button, one LED and minimal passive components. 2 layer board of 0.94 x 0.63 inches (23.8 x 16.0 mm). Uploaded: April 11th, 2015 19:04. Level translator for 2x3 AVR ISP. 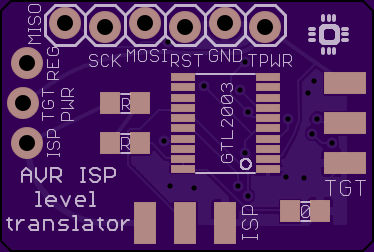 Based on GTL2003 chip; jumper to select voltage between 3V3 onboard regulator, ISP voltage, or target board (powered independently); breakout pads for a breadboard. Designed to be flat (headers mounted on the sides). 2 layer board of 1.03 x 0.48 inches (26.1 x 12.1 mm). Uploaded: April 11th, 2015 19:30. SMT version of Little Wire (optional 3V3 regulator and 3V3 operation, optional microUSB or miniUSB connector). LEDs on power and PB1.